I read this article and found it very interesting, thought it might be something for you. The article is called 5 Behaviors that Make Teams Great and is located at https://teamperformanceus.com/2017/02/5-behaviors-make-teams-great/. What is your biggest team complaint? One of the biggest complaints that I have addressed in the workplace during the past 30 years is that people do not feel safe speaking up and trusting others. They hide their true selves and feelings from others for fear of being ridiculed or ostracized. Many employees report that they have been victims of workplace bullying, mismanagement and gossip. Statistics show that unhealthy work conflict, lack of trust, and non-transparency cost businesses time, money, and productivity. A survey conducted by CCP Inc. found that U.S. employees spent 2.8 hours per week dealing with conflict. This amounts to approximately $359 billion in paid hours or the equivalent of 385 million working hours. Conflict in the workplace amounts to time and money spent on employees not doing the jobs they were hired to do. This leads to a weak workplace culture with low growth potential. What is this costing your organization? Be sure to take our Quiz: What’s the Weakest Component Of Your Team to find out. Last year, I had a client share that her work culture does not allow her to look weak in any way. Despite the fact that a big part of her was afraid to fail and show any weakness to others, she had to muster strength at work and at home to make it through her day. Our work together has been about trusting herself and being vulnerable to make mistakes. Once you can demonstrate those behaviors for yourself, you can then grant permission to others to do the same. I call it the path least traveled because many avoid the path that takes both courage and willingness to look one’s self in the mirror. 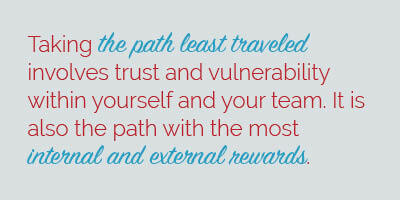 Taking this path involves trust and vulnerability within yourself and your team. It is also the path with the most internal and external rewards. 2. Encourage companies to build a strong foundation of trust that fosters improved teamwork and results. When teams have the courage to embark on the Five Behaviors of a Cohesive Team journey, they start with a foundation of trust with an added dimension of vulnerability. From there, each behavior builds upon the next. Where do you unite as a team? Do you feel safe enough to take your true self to work and have the courage to make the needed changes? What would it look like to have an amazing team that trusted one another enough to move to the next level? THESE FIVE STEPS REALLY WORK! Want to learn more about how to make things great at work? Check out my article Create a Rockstar Culture: 10 Steps to Get People to Give Their Best.